Mr WJG Anderson, the first principal of WHS, brought the school badge into existence in 1919. It consists of a kudu head against a blue and light blue background with a white banner behind the horns. The kudu is the image of beauty, grace, vigilance and pride. The blue refers to the open spaces and the sky. The white symbolises virtue and unity. Symbolism: First used in 1921. The kudu is the image of beauty, grace, vigilance and pride. The blue refers to open spaces and the hopeful future of the heavens. White is symbolic of the way of virtue and unity. Motto: The Motto, since 1917, is Virtus Floreat meaning that virtue flourishes. Founding of WHS: By Mr. W.J.G. Anderson on 5 February 1917. 1917: On 5 February 1917Windhoek High School opens its doors and makes history as South West Africa's first secondary school. The medium of teaching is English. Our first principal is Mr. WJG Anderson who opens the school with seven grade nine learners. 1919:The school badge and motto is established. 1921: The school's first four matric learners write the National Examination. The school uniform makes its first appearance. 1923: School relocates from Robert Mugabe street to its current location. 1932: School adopts Afrikaans and becomes a dual-medium school. 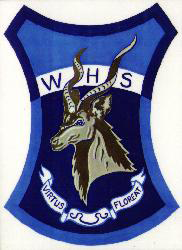 1935: WHS becomes the only tri-medium school in Southern Africa: English, Afrikaans and German. 1938: Building of school and Small hall is completed. 1952: School anthem is used for the first time. 1961: For the first time, more than 1100 learners are registered at WHS. 1962: Medium of instruction becomes Afrikaans. 1974: New school hall and laboratories are inaugurated. 1991: Namibia becomes independent. Reintroduction of English as medium of instruction in all classes. 1998: Internet is available to learners. 2016: The most successful sporting year ever. Windhoek High School is steeped in tradition and we pride ourselves on creating a bond between our learners and our school that lasts a lifetime. Tradition is what makes WHS unique and different. It unites everyone that is part of the blue school and turns learners, old scholars and teachers into a lifelong commitment. House competition (1954): Kanniedood, Swarthaak and Wag-n-Bietjie. When leaners join WHS the join a family that believes in loyalty, focus, direction and the will to win and succeed. The school anthem was composed in 1952 by two very respected teachers at WHS, Mr Giepie Theron and Dr. Fritz Maske. The first verse in Afrikaans and the second In English, because at the time, WHS was a dual medium school.